A special Thank you to Harper Collins and NetGalley fro sending this book to review. I really enjoyed this book. It was filled with action, so much that I thought my iPhone would explode! This is the most thrilling books I've read this year. I've read it 3 times now and it hasn't gotten old. I think I will read it for the 4th time this summer if I have time. All people who love science fiction and head strong teenagers will love this book. 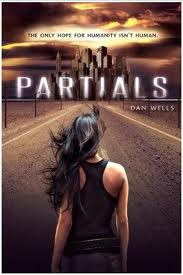 I just finished Partials this week myself and really enjoyed it. Can;t wait for the sequel! This is on the shelf at work and I keep thinking I should buy it. I'm seeing it around a lot at the moment.